One of the most amazing things with any sport is when a game comes down to the final play to decide it. Sometimes it's the final pitch, or the waning seconds of overtime that determine a winner. At the Pro Cup Series race at Ace Speedway (NC), a 250 lap contest came down to the final inches. After so many hard fought laps, the race ended up coming down to being decided between two drivers with slightly different motivations but had one thing in common. They both wanted to win. They both wanted to win badly. 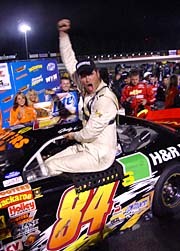 For race leader Jody Lavender, it had been nearly seven years since he had tasted the sweetness of victory in any type of racecar. One lap, 4/10 of a mile and a winner would be declared. Coming around the final turn Fogleman slipped slightly and Lavender wheeled it off the final corner and down the stretch to nip the veteran driver by a matter of inches at the line. The margin for Lavender's win was a mere .091 seconds. 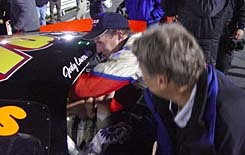 “They were counting them down and telling me how many laps were left,” said Lavender of the nail-biting last few laps. “I finally glanced to see the white flag and I knew it was going to be close. For the challenger, Jay Fogleman, it had been over a year since he had won a Pro Cup race. 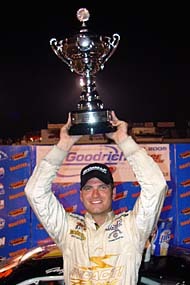 The Series veteran had nine Pro Cup wins to his credit and several local wins at Ace which is his home track. Who needed the win more? That is up for debate. Who wanted it more? Both drivers were hungry to make it happen. The two drivers dueled side by side, in an ultra-clean display of sportsmanship to the end. Fogleman to the inside, and Lavender hanging on for dear life on the high-side. Every fan was on their feet when the white flag was displayed. Lavender held on for the win and then crashed into the inside wall just before turn one after the checkers flew. Coming to the white flag the two cars were as close as they could be. But they still kept it clean. And what a sweet win it was for Lavender. A win made even more special by the means in which it was accomplished. A smiling Fogleman, who will have to wait for another day to return to victory lane, was not sore at all about the runner-up effort. “I'm kind of tickled to death and frustrated at the same time. It's been a while since we've had a win and I really feel like we had one tonight and it slipped away from us a little bit. That's racing. Often in racing, desperation for a win results in more aggressive driving tactics. 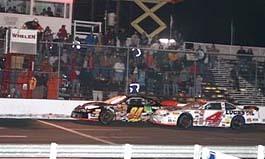 But there were no last lap bumper tactics here... just good clean short track racing. “Here at Ace, you're going to touch some,” added Fogleman. “But we have the same engine builder, Birdie (Lavender's crew chief Steve Bird) crew-chiefed for me last year and those guys have worked extremely hard to win a race. I just can't see taking someone out for a win. I will route and gauge and do whatever I can to win a race. I just won't wreck 'em to win a race. If you play Monday morning, or in this case weekend, quarterback, you can come up with so many scenarios that could have changed the outcome of this amazing finish. Should Jay Fogleman have been more aggressive? Another “what if” situation almost ended Lavender's chances at even finishing the race. With only a handful of laps remaining, he narrowly escaped disaster making contact with Jake Hobgood. Hobgood was trying to stay on the lead lap and racing the leaders hard when the two hopped wheels. The contact sent Hobgood into the wall had and collected point leader Shane Huffman in the process. 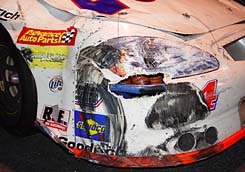 Lavender drove away with only a few more battle scars on his #84. With all of that behind him, Lavender was left to face his biggest challenge. 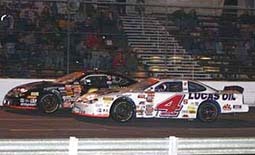 He was up against a man with as many laps at Ace Speedway as anyone in the field. When Fogleman's Lucas Oil Ford got underneath Lavender's machine, most on-lookers thought the race was over. Even Lavender thought he was a sitting duck at that point. Lavender has been through his share of hard times over the last handful of seasons. He and his family supported teams have struggled in the NASCAR Southeast Series and in the big leagues of the Craftsman Truck Series. After disappointments in both, the big win at Ace heals some of those wounds. “It gave me a chance to prove to myself and everyone else that I can compete at this level, said Lavender. “We've had some good runs and some bad runs. This win removes a lot of doubts and hopefully now we can come back to victory lane. Twenty five Pro Cup races, and seven or so years between wins is an awful long time. But for Lavender it was all worth it. Lavender is now in the history books as a Pro Cup winner. The win came in one of the most classic races in Hooters Pro Cup Series history. But most importantly, the way it was decided will be what leaves a lasting impression on both of the drivers and anyone that was in attendance.